"This is an old German recipe that's become a family favorite. I have adapted it to mix and raise the first time in your bread machine. I make it every year at Christmas for gifts and everyone loves it. It's also delicious anytime, especially warm with butter on it!" In a small bowl, dissolve potato flakes in boiling water. Let stand until lukewarm, about 15 minutes. Place ingredients in the pan of the bread machine in the order recommended by the manufacturer. Select Dough/Manual cycle; press Start. The mixing and first rise of the dough will be completed in the bread machine. When Dough/Manual cycle is finished, remove dough and briefly knead on a floured board. Divide dough into 3 round loaves and place in three lightly greased 8 inch pie pans. Cover and let raise until doubled in size, about 60 minutes. Meanwhile, preheat oven to 350 degrees F (175 degrees C). In a small bowl, combine 3 tablespoons sugar with 1/2 teaspoon cinnamon. 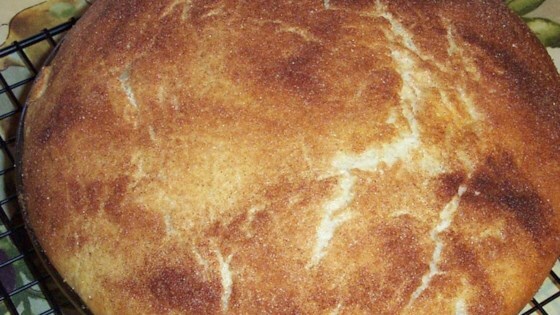 Brush risen loaves with melted butter and sprinkle with cinnamon sugar mixture. Bake in preheated oven for 20 minutes, or until golden brown. Satisfy your sweet tooth with this nutritious idea. This is a great recipe! I wasn't so sure at first, but the next day it was even better. It is great with a little butter on each slice. Yum! I'll make this again.